There are those who camp solo. These are the people who hike the back trails of the world; and use camping as a way to reconnect with nature. Myself? Hooey to all that. I'm a social camper. It's all about reconnecting with friends and having a good time. Camping is an excellent way to be social, away from the normality of technology. A time where friends can actually talk and interact face to face. Being secluded in the woods somewhere is all the more reason to let go. I try and camp at least once a year but every couple of years, I try and get a larger crew together. A crew of good friends for some shenanigans. This is a title that uses people like me, far away from civilization as a scary backdrop. As much as it is fun to party in the woods, there's always a chance for something terrible to happen. "Stillwater" illustrates this point using the worst scenario possible. Murder. Murder in the desolate woods. The concept here is simple. A group of friends, and a few uninvited (sort of) guests go camping for the weekend. It's all about the good time until suddenly it isn't. Old school friends catching up and having a grand ol' time. Something I personally can relate with, as I'm sure most people can. Not the most original concept for a horror film, but it definitely works. As the characters introduce themselves to whoever happens to be watching this title, the director, Nino Aldi, attempts to let us know these are normal people. No different than our own friends. This lengthy introduction is one of the major drawbacks of this title. Chalked so full of dialog and normality you may find yourself wondering if this is a thriller/horror film at all. I'll go out on a limb here, pun intended, and say it felt like Aldi was forcing a backstory on me. Instead of letting the characters unfold naturally. I can't say the production or actors themselves did a bad job here, only that the pacing was very slow. At first. ... and it all ends so fantastically! The slow paced build pays off in spades by the revelation of what happened during this camping trip to hell. Anyone who doubts a 3.5 star rating before this title concludes, will completely understand when it's all over. The ending was fantastic. It more than made up for any slip and falls along the way. It's like a button was pushed and everything just clicked. It was that good. This title would have benefited largely if it was shorter. I can't fault the director or the cast themselves for the slower pacing; that's just the way it is. But honestly, even the slower areas of the film were not bad. Without the excellent ending, I still would have rated this title as an average film. Camping. Murder. What's not to love? I also happen to know a lot of people exist who enjoy the slow burn. 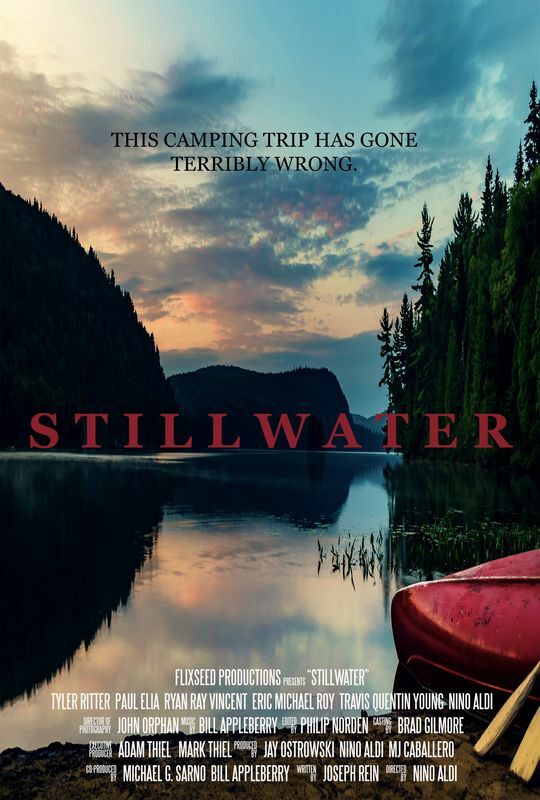 "Stillwater" promises a camping trip gone terribly wrong. It delivers. What more can be said?